In all seriousness, I’m not gonna pretend that I just lightly seasoned the salmon with some salt, pepper, and lemon juice, and then delighted in the wonderful taste of the sea as I ate my dinner. On the contrary, I crusted that fillet up with all kinds of seasonings, topped it with a delicious, creamy sauce, and then rejoiced in the fact that I could only detect a hint of salmon flavor. Enough to know it was salmon, but not enough for it to taste too fishy. Success! 1.) Mix the brown sugar, chili powder, smoked paprika, smoked salt, and cayenne pepper in a small bowl. Meanwhile, heat a skillet (non-stick is helpful) over medium heat. 2.) 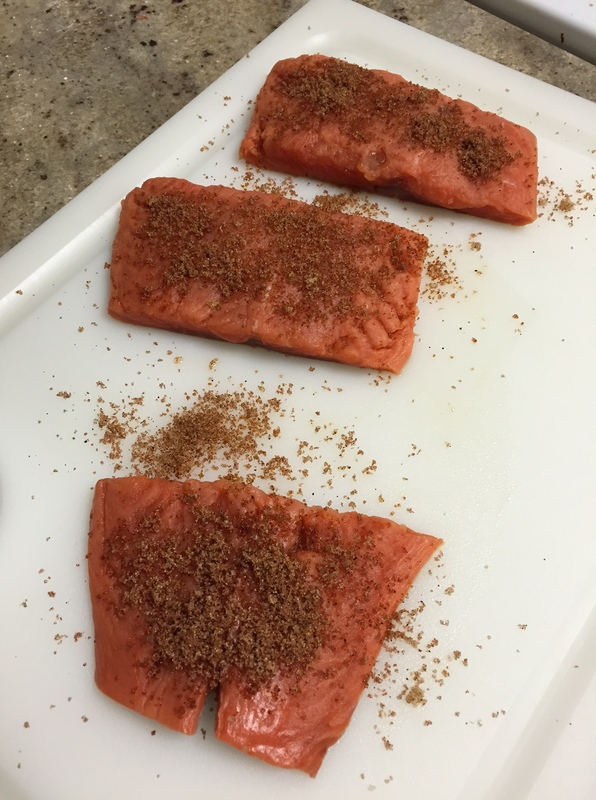 Gently rub the spice mixture into all sides of the salmon fillets. Add about a tablespoon of olive oil to the pan, and add the fillets, skin side up, to the pan. Cook for about 3 minutes on the first side, depending on the thickness of the fish, until each fillet has a nice, dark sear, and then flip. 3.) Cook the fillets for about 2 minutes on the second side. Meanwhile, place your limes in the pan, cut side down, and allow them to caramelize. Flip once the first side is a nice golden brown. 4.) While the salmon fillets cook, place all the ingredients for the sauce into a food processor or blender, and pulse until the sauce is smooth and creamy. 5.) 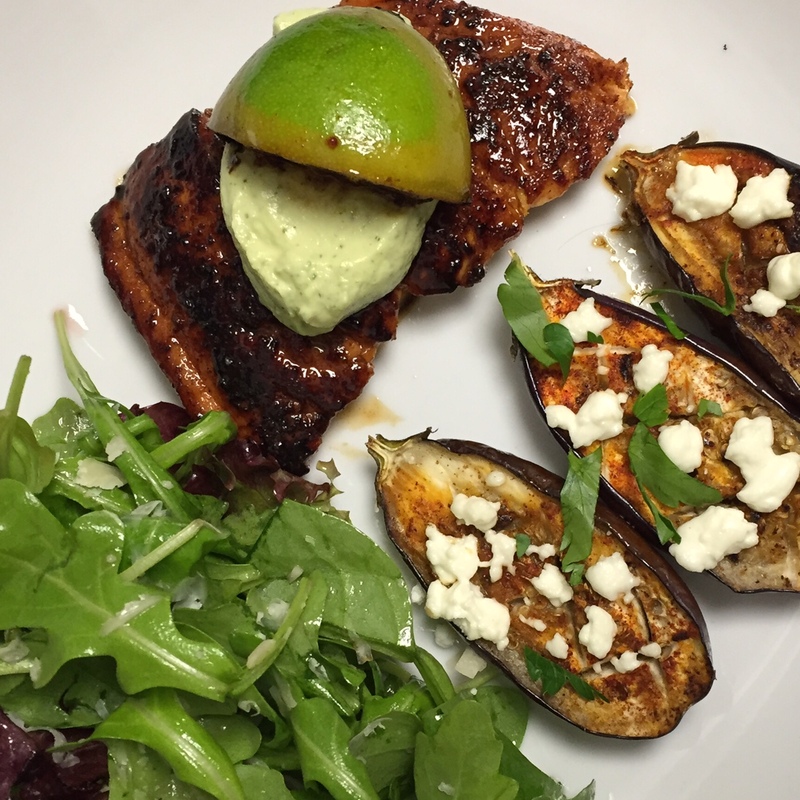 Serve each fillet with the sauce spooned over the top, and a caramelized lime wedge. Squeeze the lime over the fish, and enjoy! 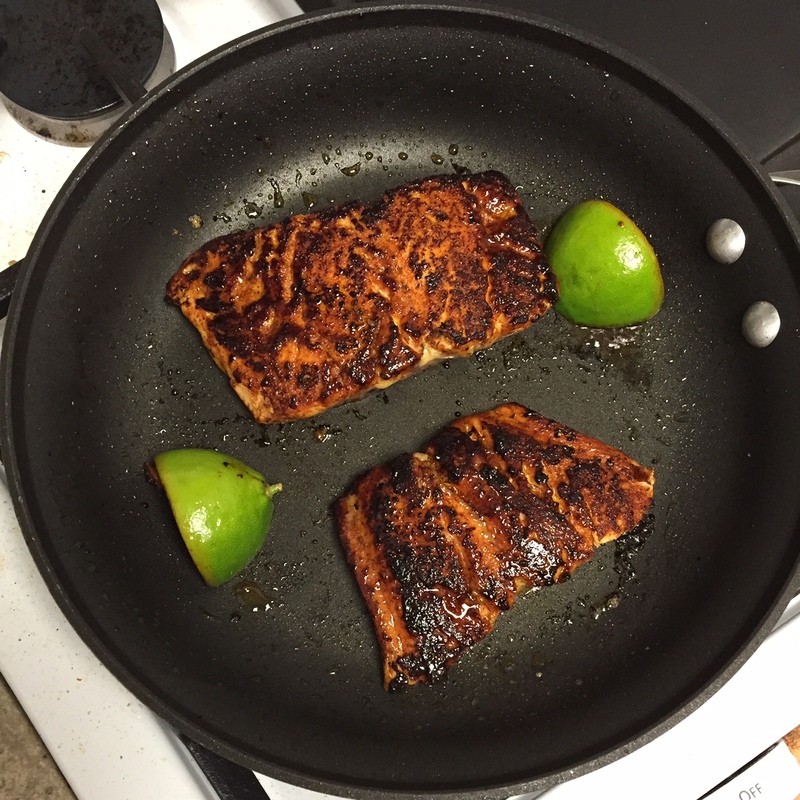 Like I said, this salmon recipe is not for you if you like the pure, unadulterated flavor of salmon. However, for those of use that want the health benefits of eating salmon without the fishy taste, this is PERFECT. The sweet, spicy, and smoky seasoning gives the fish a ton of flavor without completely covering it up, and the cool, creamy avocado sauce is fantastic. My husband literally ate the leftover sauce with a spoon, and proceeded to make proclamations about how delicious it was all evening. This recipe also fits nicely into the category of “impressive enough for dinner guests, but easy enough that you’re not stuck in the kitchen all night.” There are never enough of those kind of recipes, are there? Even as a pure salmon lover, I will definitely check this out! If you haven’t already, try grilling or baking salmon with either mayo and fresh cracked pepper (and/or dill) on top or add pesto after its cooked. 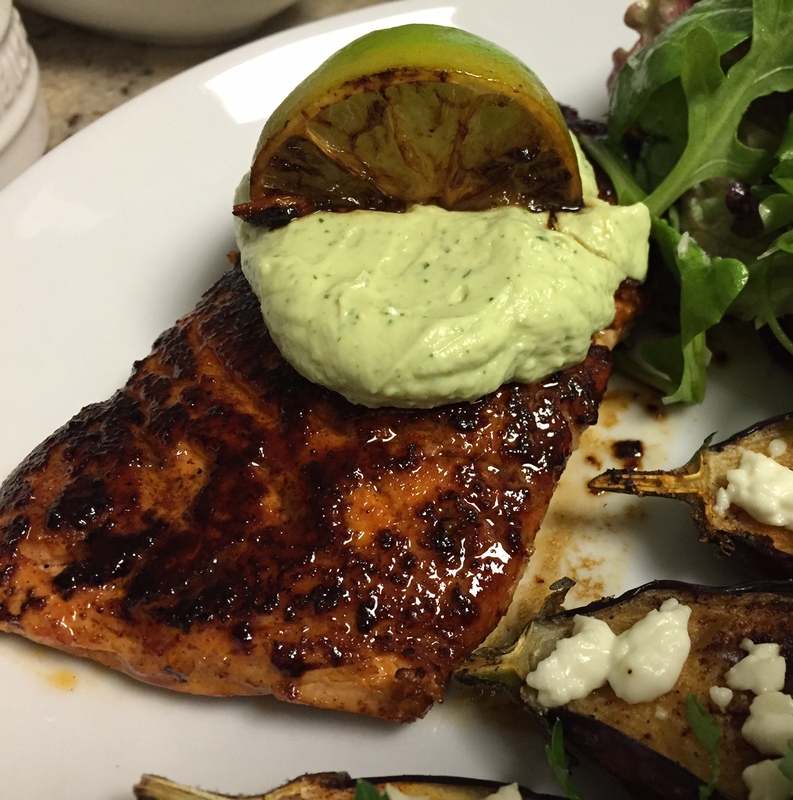 You’ll get those great Omega 3s, but the mayo/pesto will help mask the flavor. So proud of you for starting to enjoy salmon! I am a huge salmon lover, but I can appreciate others are still warming up to it. 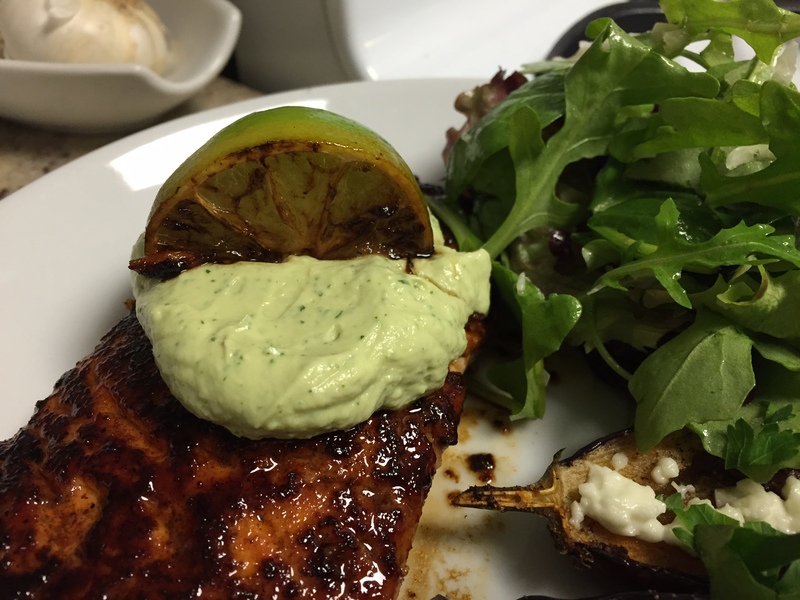 For those people, I’m really excited to try this spicy salmon recipe! If you’ve tried it, let me know what you think! I occasionally order salmon at a restaurant when I want to be healthy. I feel like I’m just a tad higher on the “I love salmon” scale than you. I tolerate it and even enjoy it sometimes, but I’m not gaga. With that said… I really only avoid cooking it because I fear it’ll make my house smell. Can you report on your findings? If it’s not so bad, I’m definitely giving this recipe a try. I didn’t notice that it left much of a smell in the house! I could smell the spices in the crust far more than the fish itself. If you DO notice a lingering smell, you can always throw some water and a bit of baking soda into a pot, and let it simmer for a bit… That should help take the smell out of the air. Good luck! !